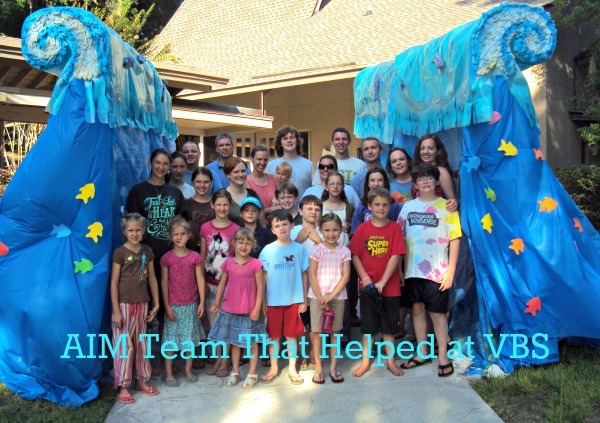 Yesterday, I talked about the impact we were able to have on the VBS we helped with in South Carolina. The subject matter was the journey of Moses and the children of Israel through the wilderness. * A wonderful man from the church dressed as Moses each day and presented the Bible lesson to the children. He was phenomenal! The children walked the property, going on their own wilderness journey (complete with grumbling and complaining). They ate tasty treats to remind them of the manna and quail the Lord sweetly provided for them in the desert. They learned of the support provided Moses by Aaron and Hur as they tried to hold up their arms as long as they could. All these lessons were meaningful representations of this period in our history. The children were captivated by “Moses’s” story-telling ability, as well as by the object lessons. Day four, however, made the biggest impact. The story was of the Passover. 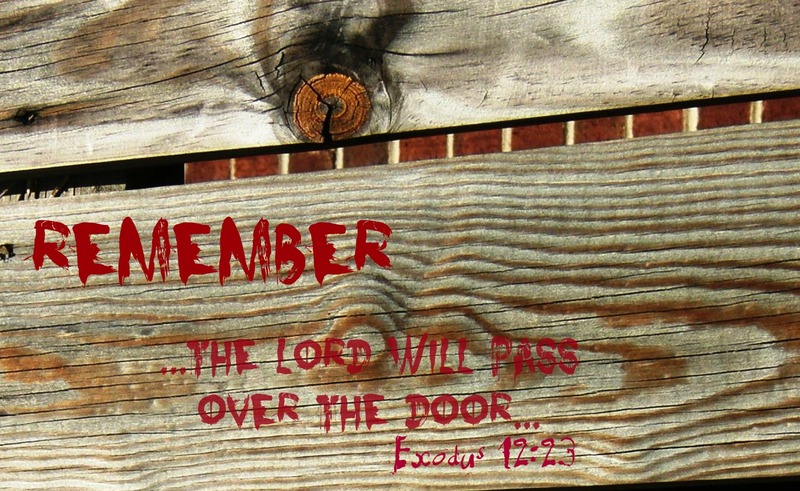 After hearing Moses describe the events, the children were able to paint red on the doorposts of “houses” in a simulated dark, Egyptian evening. As I stepped into the darkened room with my group of children, and watched my little boy paint on the doorposts of a “house,” I was moved to tears. As simple as that act was for the kids, it was meaningful for the world when it really happened. The foreshadowing of Jesus’ own blood covering the doorframe of my heart became real in a way that it never has before. Even as I write this, several weeks later, I tear up again. Because of what He did for me, I can live for Him..and with Him. *Note: I do not know if the ideas were from the curriculum they used or were their own. A few days before we left on our missions trip, we learned we would be working a VBS (Vacation Bible School) at the church where we were staying. I have to be honest. I wasn’t thrilled. We do VBS at our church, Lord. Why go to another state and help them with theirs? But, alas, I was short-sighted. The Lord had big plans. Sometimes missions work is to other members of the Body of Christ. After we arrived, we learned the story…and why we were here. The VBS had been very carefully planned. With a church full of eager and creative people, the scenery was beautifully done, the crafts were carefully planned, and the snack time food was sure to be a hit. What they did not have enough of was workers. In fact, the VBS director had been praying on the drive to work one day, asking the Lord how this work was going to be accomplished without the workers. Not coincidentally, our team lead came to see her that day to tell her that she had a team coming in that could work for the week. So…we were a direct answer to prayer to work that VBS. Boy, does that feel good! Thanks, Lord, for the blessing of seeing that we were needed! And you know what? It was actually the best VBS I have ever attended. Dear Father, thank You for the reminder that Your ways are not our ways, and that there is work to be done for the Kingdom all over the place. Thank You that we got to be a part of the blessing You gave to Providence Presbyterian. You broke open the box I had put You in, dear Father, and I thank You for that! In Jesus’ Name, Amen. We had the extreme joy of attending our second missions trip through Adventures in Missions last week. And, just like last year, God showed up in a mighty way. Praise Him! We began our week as a group strangers…believers from across the country who had only a love of our Savior and a desire to serve Him in common. We ended the week as family. Virginia, North Carolina, New York, Georgia, Alabama, Nebraska, Connecticut, Illinois. Cities, suburbs, and farms. Young and old. Big families and small. Our demographics did not affect our love for our Savior, nor our ability to serve Him. Big projects and small. Serving brothers and sisters in Christ and working to introduce others to Him. Hot and sweaty jobs and peaceful ones in air conditioning. It is amazing to me what a week together will do to bond people together. It is a beautiful thing. For the rest of our time on this earth and into eternity, we will have each other…to pray for and to pray for us, to understand and remember the joys and hard work done on our trip, and, Lord willing, to spend more time with before we journey to Heaven. Over the next few days, I will be sharing what God did in us and through us. May you be blessed by my recounting. We certainly were blessed to be living it! Being third in the line of boys…and the quietest of my bunch…sometimes Jackson gets lost in the mix. He is just not the total extrovert that the rest of us are. He needs time to rejuvenate and refresh…alone…before tackling people again. This is not to say that he isn’t friendly. I get comments all the time about how good he is with new kids, including them easily in whatever he is doing. He showed this trait on the missions trip. He is also a ham. He is the one to tell the jokes, albeit often corny. He loves to be clever with his words. He showed something else, a budding strength that I think will get him far in this world. When the situation calls for it, he can be bold. Now, since he was a little guy, Jackson has been the monologue king. He would be sitting on the floor, playing with a toy, reciting the lines from some show he had seen. He could remember long passages, even at a very early age. I have asked him about trying community theater. We have a couple Christian children’s theater groups here in the area, and I told him he could take a class. So far, he has refused, saying he doesn’t like that kind of thing. Enter the missions trip. He and one of the other boys on the trip really hit it off. He and Ethan hung out a lot, talking 90 miles a minute, planning things for the future. They also planned to be part of our team talent show. They chose to do a skit. In fact, as people backed out on them and changed things several times, they still were determined to do something in the talent show. The skit they did was just about what you would expect a couple 8-year olds to do. It was silly. They messed up, but kept going. They had a ton of fun doing it. And, silly as the skit was, my heart swelled. Now, I have no illusions that I have a budding Olivier…I am not even sure I would want one of my boys to fight the Babylon of Hollywood. But I am convinced that the boldness he is learning to display…both in getting up in front of everyone, and sticking to his guns about participating even when others dropped out…will be used by God in mighty ways. My little guy is growing and changing into what I pray is a budding man-after-God’s-own-heart. And I glory in it. My sweet Matthew is often in Alex’s shadow. Part of it is probably my fault. As an oldest myself, I have a similar personality and outlook as Alex and I often turn to him first, whether Matthew is capable of accomplishing the same task or not. On the missions trip, Matthew had an opportunity to shine in a new way…one that brought tears to my eyes. My husband Keith was a kid-person. He was the one they asked to work in the nursery at church, the one to whom they would give the crying child. He was a gentle giant who was perpetually patient with little ones. My boys have a lot of their dad in them. I get lots of compliments about how they treat younger kids, how they greet visitors, and how they pitch in to act as good friends. And I praise God for it! Matthew has always had a sense about people. We call him the little emotional barometer. He can walk into a room and know who needs a friend, who needs a word of encouragement, or a word of prayer. It is joyous to watch as he looks for the person with whom he is supposed to connect…and then makes that contact. On the missions trip, Matthew really got to use this gift. We were at the Vacation Bible School at the Boys and Girls Club, and there was a little boy named Cal. He was barefoot, with a shock of blonde hair, and wearing glasses. And he took a shine to Matthew. Matthew, in turn, began to lavish on him the love of the Lord. Eleven year old boys are not the most “aware” lot on the planet. Too much going on mentally, I think: puberty encroaching and affecting hormones, learning to manage the ever-changing body, seeking to find a place in the “cool” scale of peers. So, to see my guy come outside of himself and give to this little boy made me teary. Even more wonderful was how God used this beautiful friendship the next week. 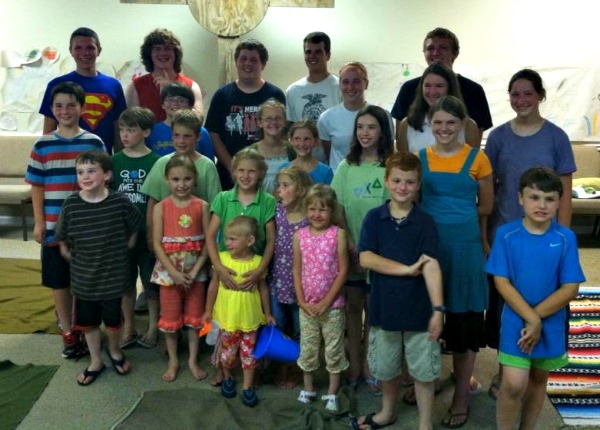 We had Vacation Bible School at our church, and there was a family with an autistic son. Matthew easily reached out to this little boy as well, helping to make him feel comfortable. I got several compliments over the way he pitched right in, and how good he was at reading little Thomas. I am not sure if Matthew has found his calling for life, but I do know that God is glorified by the things he learned…and applied…from our missions trip. There are times when you see God doing cool things in your kids that just bless your socks off. I had many moments on the missions trip of this, some for each of the boys. My sons all do much to make me proud of them, but there are few moments in my life that I have been more proud than when Alex is leading me in worship. Alex has been involved in the teen worship band at church for the better part of three years. Our church is blessed to have a host of talented teens and a gifted director of their worship. They truly do most of the lead worshiping for the congregation on Sunday mornings. It is truly a joy to see. When we went on the missions trip, none of us Wrights thought about bringing instruments for worship. Alex left his guitar at home, and Matthew left the bongos. I did not even think about how worship would be accomplished. After arriving in Tennessee, Alex volunteered to help with the worship team that was assembling. We had several singers, a keyboard (donated while we were there, but that is another story), and a guitarist Alex’s age. Now, I didn’t have a real worry about Alex “fitting in” with a different group of worshipers. He has proven himself to be flexible and mature. But still…as his momma, I said a prayer. Maybe two. And things worked beautifully! 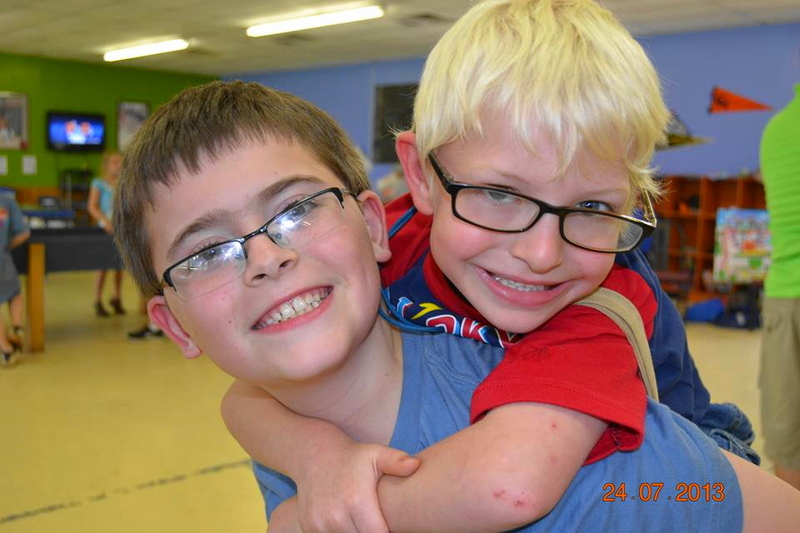 Alex and his new friend Joshua shared the duties of playing guitar, working together, helping each other. The worship was…in a word…AWESOME! God was so there with us…different as we were, as short a practice time as they had. And in the midst of it was my little boy. You know, moms always look at their kids that way, at least to an extent. He was following well, going with the flow, and worshiping God. No attitude, no showing off. My great friend TJ who leads the teen worship bands works hard to make sure these young people understand that they are merely the lead worshipers…not there to put on a show but to help the congregation worship. By Alex’s behavior, he obviously gets it…and is joyfully applying what he has learned. And it makes me realize that my little boy is growing to be a man…a man in the image of his father Keith…and his Father God. Our team leads on the trip talked about us constantly working to stretch ourselves in our walks as we worked on the trip…and in our lives in general. And I saw a lot of stretching going on! Even in my own family. God took me to places in an area I thought I was “good” in…the area of prayer. 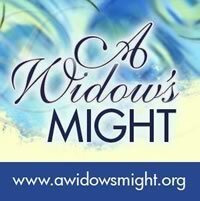 Now, I have been involved in prayer ministry for many years. It is something I can do despite my schedule and little ones, wherever I am, and all the time. It also uses words, and you all know that I am pretty familiar with words. OK – I have a big mouth. What God clued me into on this trip was praying with my hands. Jesus did a lot of His ministry by touching people…physically and emotionally. He made physical contact as he prayed over them, healed them, and ministered to them. There is no telling how many people He touched physically. 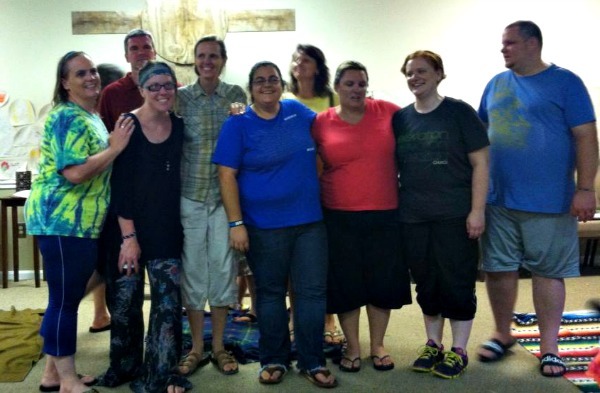 Now, I have had hands laid on me in prayer before…and have laid hands on others. But this prayer lesson was slightly different. I was laying hands on things. As I have already shared, we arrived early to the week of ministry. After we had gotten everything ready for the rest of the team to arrive, I felt compelled to pray over the chairs. Well, not really the chairs per se, but the people who would be occupying them. 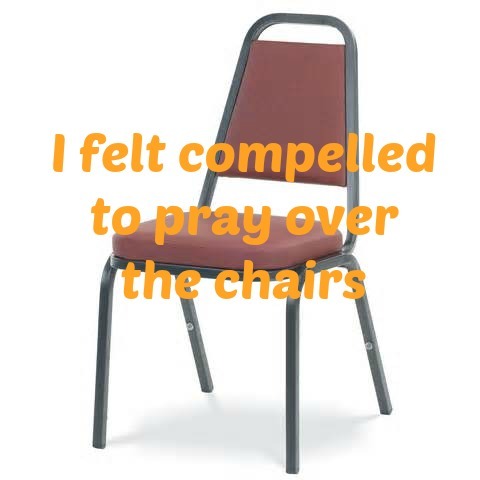 I walked through the room and touched all 60 chairs and prayed over each occupant…safe arrival, safety during the work, touching the lives of others, being touched themselves, And I felt blessed from being able to pray such prayers over individuals I had not even met yet. The next morning, I was up early, before most of the team, and again, I walked around the room and prayed for every person while touching their chair. I felt compelled each work day were were there to do the same. It was not a ritual or a talisman, but a grateful heart adding my prayers to all the others over our week and our team. When we went to M.A.T.S., the homeless shelter I have already mentioned in another blog entry, I did the same over the names of the individuals living in the shelter which were on a board in the office. I did not meet all of them, but I prayer over all of them by name before the Lord. It really was a beautiful and humbling experience for me. I have a friend in the medical profession who told me years ago that as she lays her hands on a patient, examining them, she prays over them. Every single one of them. Now I get the power of touch as a part of prayer in a new and more complete way than I previously did. And it has made me more bold in my prayers. Praise God! When our Children’s Director was stressing this week about the start of VBS, I quietly lay my hands on her shoulders and silently prayed. When one of my boys had a hurt arm, I silently prayed as I held his arm and examined it. Sometimes little things are needed to energize us for the Lord. This was one I needed…new life into this old wineskin. Praise God that He saw it and taught me something!